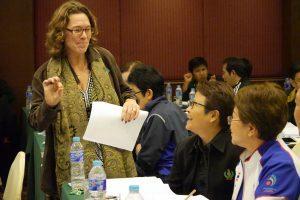 United States Sports Academy instructor and doctoral graduate Dr. Bonnie Tiell teaches students through the Sports Authority of Thailand in Bangkok. 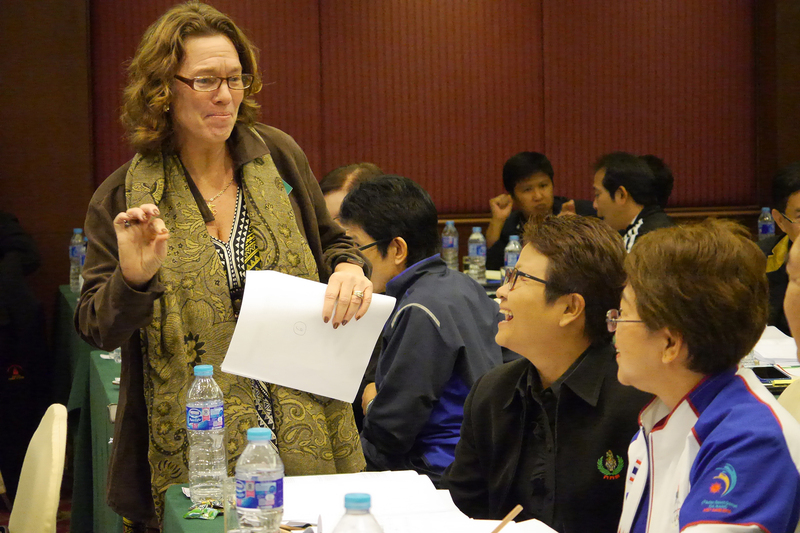 DAPHNE, Ala. – The United States Sports Academy recently sent several of its instructors to teach in the United Arab Emirates (UAE) and Thailand as part of the institution’s mission to expand sport education opportunities around the world. Academy instructors Dr. Bonnie Tiell, Dr. Christopher Rampacek, Dr. Marc Margolies, Dr. Phillip Capps and Charles Temple taught abroad as part of the Academy’s partnerships with the Sports Authority of Thailand (SAT) and the United Arab Emirates Football Association (UAEFA). In addition, Dr. Tim Dornemann and Anthony Castelon will teach for the Academy in Bangkok, Thailand. The Academy’s longtime relationship with Thailand continues as the Academy conducts its International Certification in Sports Coaching (ICSC) and International Certification in Sports Management (ICSM) programs in Bangkok, programs that have been in place for more than a decade. The ICSC program includes a wide range of coaching and related administrative skills, while the ICSM program includes management topics such as sports event planning, marketing and public relations, and facilities. 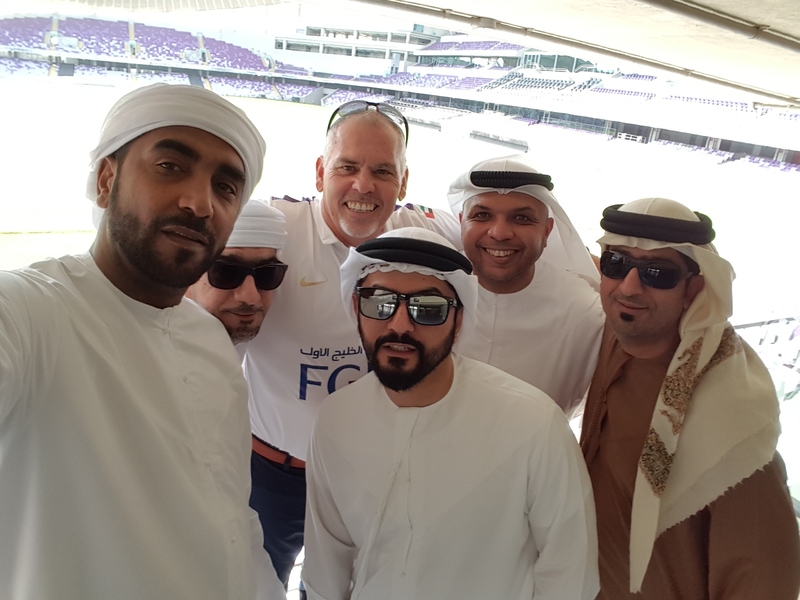 United States Sports Academy instructor Charles Temple, back center, with students from the United Arab Emirates Football Association Academy in Dubai. The Academy also continues to play a key role in the enhancement of football (soccer) in the United Arab Emirates under a cooperative effort to train football administrators through a Football Club Operators License Program with the UAEFA. The Academy is providing the faculty and instruction for the program. The curriculum includes subjects such as sports administration, sports marketing, sports media, and facility and event management. Each subject has three levels of instruction through which successful students receive in succession a “C”, “B” and “A” level license. The ultimate objective of the program is to enhance football in the UAE by improving the quality of the sport’s management. 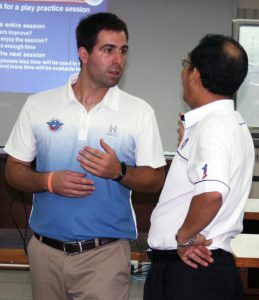 United States Sports Academy instructor Anthony Castelon of Springfield, Ill., answers questions while on assignment for the Academy in Sarawak, Malaysia, in 2012. He will teach sports performance enhancement for the Academy in Bangkok, Thailand, from 24-28 April 2017. Dr. Timothy Dornemann will teach sports strength and conditioning for the Academy in Bangkok in May. Dornemann is an assistant professor of exercise science and director of sports performance at Barton College in Wilson, N.C. Since 2010, Dornemann has served as a member of the Academy’s National Faculty, where he has taught sport courses in both Thailand and Malaysia. Anthony Castelon of Springfield, Ill., is teaching sports performance enhancement for the Academy in Bangkok from 24-28 April 2017. In 2012, Castelon was part of the Academy’s pilot program to train 1,000 of Malaysia’s physical education teachers as part of an agreement with the Malaysia Ministry of Education.